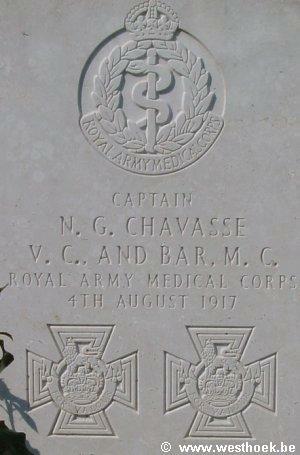 CHAVASSE, Captain, NOEL GODFREY, V C and bar, M C, Royal Army Medical Corps attd. 1/10th Bn. The King's (Liverpool Regiment). 4th August 1917. Age 32. 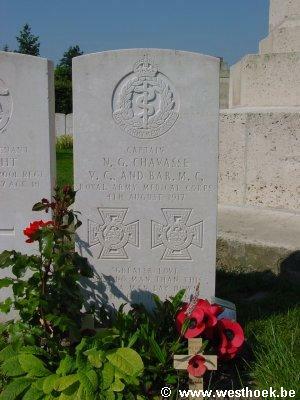 CHAVASSE, Captain, NOEL GODFREY, V C and bar, M C, Royal Army Medical Corps attd. 1/10th Bn. The King's (Liverpool Regiment). 4th August 1917. Age 32. Son of The Right Rev. The Lord Bishop of Liverpool, of The Palace, 19, Abercromby Square, Liverpool. His brother, Aidan also fell. Brandhoek New Military Cemetery III. B. 15. Extracts from "The London Gazette" dated 26th Oct 1916, and 14th Sept 1917 respectively, record the following: "For most conspicuous bravery and devotion to duty. During an attack he tended the wounded in the open all day, under heavy fire, frequently in view of the enemy. During the ensuring night he searched for wounded on the ground in front of the enemy`s lines for four hours. Next day he took one stretcher-bearer to the advanced trenches, and under heavy shell fire carried an urgent case for 500 yards into safety, being wounded in the side by a shell splinter during the journey. The same night he took up a party of twenty volunteers, rescued three wounded men from a shell hole twenty-five yards from the enemy`s trench, buried the bodies of two Officers, and collected many identity discs, although fired on by bombs and machine guns. Altogether he saved the lives of some twenty badly wounded men, besides the ordinary cases which passed through his hands. His courage and self-sacrifice were beyond praise." "For most conspicuous bravery and devotion to duty, when in action. Though severely wounded early in the action whilst carrying a wounded soldier to the Dressing Station, Capt. Chavasse refused to leave his post, and for two days not only continued to perform his duties, but in addition went out repeatedly under heavy fire to search for and attend to the wounded who were lying out. During these searches, although practically without food during this period, worn with fatigue and faint with his wound, he assisted to carry in a number of badly wounded men, over heavy and difficult ground. By his extraordinary energy and inspiring example, he was instrumental in rescuing many wounded who would have otherwise undoubtedly succumbed under the bad weather conditions. This devoted and gallant officer, subsequently died of his wounds."